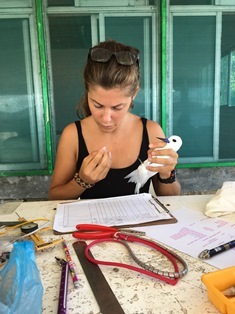 As part of a project funded by the CEPF that we are conducting with the Island Biodiversity & Conservation centre of the University of Seychelles (IBC-UniSey), we are resuming our long-term monitoring on the Seychelles White-eye populations and we have planned to organise a bird ringing training session. There was time for a brief visit, to assess Kara Beggs, Conservation Manager on Cousin Island Special Reserve. With 3 nets we caught 24 birds and 6 recaptures. One of the fodies had been ringed 6 years previously - ring FH66398. Thanks to Gerard ... 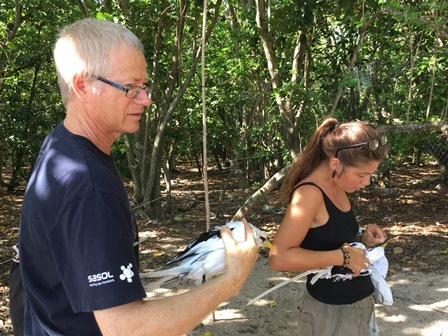 Thanks to Kara Beggs and BirdLife Seychelles for hosting me on Cousin!